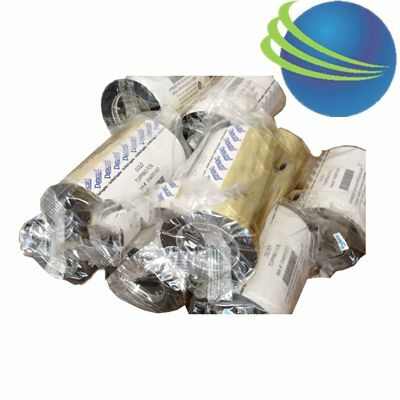 Specifically designed for Datacard printers, all reverse transfer film has system-matched performance that meets the same high standards of guaranteed quality as your printer, with reliability you can count on. Datacard 568971-001 YMCK ribbons consist of yellow (Y), magenta (M) and cyan (C) panels for printing a full spectrum of colors by combining the colors using varying degrees of heat. The K panel is a black resin panel, typically used for printing text and barcodes. Datacard 568971-001 YMCK ribbons are used for printing a combination of full-color images and one-color text or barcodes. Datacard recommends using genuine Datacard supplies to ensure the best performance from your Datacard ID printer. ID Wholesaler offers a low price guarantee on the Datacard 568971-001 ribbon. Datacard 534000-011 YMCKFKT ribbons consist of yellow (Y), magenta (M) and cyan (C) panels for printing a full spectrum of colors by combining the colors using varying degrees of heat. The F panel is a fluorescing panel that allows you to print grayscale text or images that are only visible with ultraviolet (UV) light. The two K panels are black resin panels, typically used for printing text and barcodes. The T panel is a thin, clear protective topcoat. Datacard 534000-011 YMCKFKT ribbons are used for printing a combination of full-color images and one-color text or barcodes. The F panel in the Datacard 534000-011 YMCKFKT ribbon provides an economical way to include an effective anti-counterfeit security feature that is difficult to forge. ID Wholesaler offers a low price guarantee on the Datacard 534000-011 ribbon. Note: The Datacard 534000-011 has replaced the Datacard 552854-514 ribbon. Datacard 534000-010 KTT monochrome ribbon kit. Datacard 534000-010 KTT black monochrome ribbons are primarily used for printing text and one-color line art on one or both sides of a card. To maintain your Datacard card printer's warranty, genuine Datacard ribbons must be used. As an authorized Datacard Solution provider, ID Wholesaler only sells Genuine Datacard 534000-010 Ktt Black Monochrome Ribbon. ID Wholesaler offers a low price guarantee on black monochrome Datacard 534000-010 ribbon. Note: The Datacard 534000-010 replaces the Datacard 552854-540 ribbon. ID Wholesaler offers a low price guarantee on the Datacard 534000-009 color ribbon. Note: The Datacard 534000-009 has replaced the Datacard 552854-510 ribbon. ID Wholesaler offers a low price guarantee on the Datacard 534000-008 YMCK ribbon. Note: The Datacard 534000-008 has replaced the Datacard 552854-502 ribbon. Genuine Datacard 534000-007 YMCKTK color ribbon kit. Datacard recommends using authentic Datacard supplies to ensure the best performance from your ID card printer. ID Wholesaler offers a low price guarantee on the Datacard 534000-007 YMCKTK ribbon. Note: The Datacard 534000-007 replaces the Datacard 552854-520 ribbon. 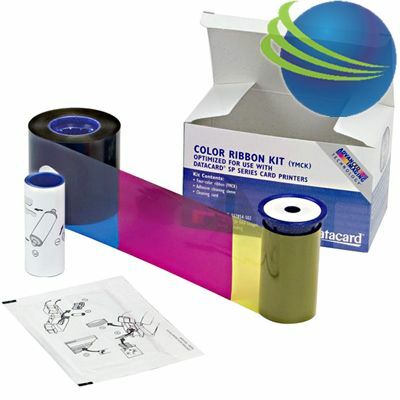 Genuine Datacard 534000-006 YMCKTKT color ribbon kit. Datacard recommends using authentic Datacard supplies to ensure the best performance from your ID card printer. Datacard 534000-006 YMCKTKT ribbons are used for printing a combination of full-color images and one-color text or barcodes, and feature an Earth-friendly biodegradable core. 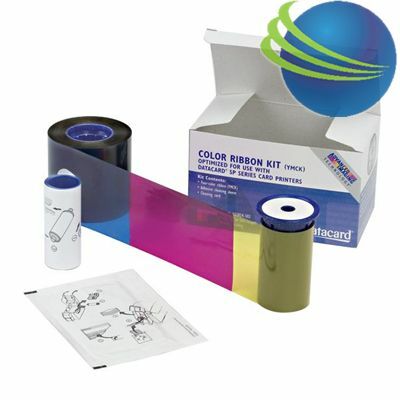 YMCKTKT ribbons consist of yellow (Y), magenta (M) and cyan (C) panels for printing a full spectrum of colors by combining colors using varying degrees of heat. The two K panels are black resin, typically using for printing text and barcodes and the two T panels are thin, clear protective overlays. replaces Datacard 552854-530 color ribbon model. Ribbon màu chính hãng Datacard dùng cho các dòng máy in thẻ Datacard SP25, SP35, SP55, SP75 và SP Plus. Dùng để in ký tự, mã vạch hoặc hình ảnh đủ màu trên thẻ nhựa. Một hộp mực có thể in được 500 thẻ. Datacard K 552954-501 Ribbon đen,Sử dụng Datacard SP35, SP55, SP75,SP35Plus, SP55Plus, SP75Plus. Ribbon màu đen (552954-501) chính hãng Datacard dùng cho các dòng máy in thẻ Datacard SP25, SP35, SP55, SP75 và SP Plus. Dùng để in ký tự, mã vạch hoặc hình ảnh đơn màu trên thẻ nhựa. Một hộp mực có thể in được 1,500 thẻ.